Palma de Mallorca  is the island's only true city, and the capital of the Balearic Islands. A city on the island of Mallorca, one of the Balearic Islands off the Spanish east coast. Palma is the capital of the Balearic Islands, is the largest city in Mallorca; the population of the Palma municipality was approximately 400,000 at the beginning of 2007. Half the population of Mallorca lives in the city of Palma. The city occupies the north western end of a bay in the south west of the island of Mallorca. The city council also has jurisdiction over the sub-archipelago of Cabrera including the islands of Cabrera, illa des Conills, Estells, Imperial, Redona, Foradada, Plana, and Pobra. The name Palma dates back to the Roman settlement on the site of the present city, although the area was originally settled during the Bronze Age. In the early middle ages it was conquered by Arabs, who named it Madina Mayurqa. In 1229 it was conquered by King Jaume I of Aragon, and became an important trade city. Palma saw its dark ages in the 16th century, when a significant decline was caused by attacks from Turkish and Berber Pirates and through plague. 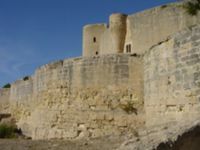 In the early 18th century the island was conquered by the French-Spanish army, and King Philip V outlawed the island's government and culture. Later, Carlos III established a free trade pact with the Indies, which had a huge impact turning financials around in Palma. The city became a tourist destination in the 1950s, and tourist numbers have continually increased in the subsequent half century. Palma is a busy commercial and cultural center of Mallorca. This autonomous region of the Balearic Islands of Spain have over half of the island’s population living there. The holiday season lasts from the end of April until October; from November to April, temperatures range from 20-28 degrees Celsius (60-70 degrees Fahrenheit) and may require a jacket in the evenings. Palma's city airport (IATA: PMI) is the major airport in Mallorca, and has daily flights from many European cities on national and budget carriers. The airport is managed by Aeropuertos Españoles y Navegación Aérea . PMI is only 9 kilometres from the center of Palma. EMT's Line 1 bus service runs between the sea port, the city centre and the airport every fifteen minutes between 6:15am and 2:30am. The fare is €5, and can be purchased from the bus driver with cash. Locals are charged only €1.50 for the same journey. Alternatively, the cheapest way to make the journey is a combination of walking and public bus. You can even have a pitstop at the beach. Make an immediate left after exiting the terminal and follow the road around via the sidewalk. At a cargo warehouse you will turn left and follow this road (no name). Eventually it intercepts with Cami son Metge and there is a gap in the fence. Go left and follow this road until you find a footbridge across the main highway. Cross and then follow Camí de Can Bogueta until it intercepts with the coastal road - on the same side a 25 (Express - 15 mins) or 15 (Local, stops many times along the coast 30 mins) will get you into Palma for €1.50. Walk time is max 30 minutes, some along a quite busy road. A Taxi from Mallorca Airport costs between 29€ (s'Arenal, Platja de Palma, Ciutat Jardí, Portitxol) and 35€ (Palma City Center, Port de Palma / Palma Cruise Port). 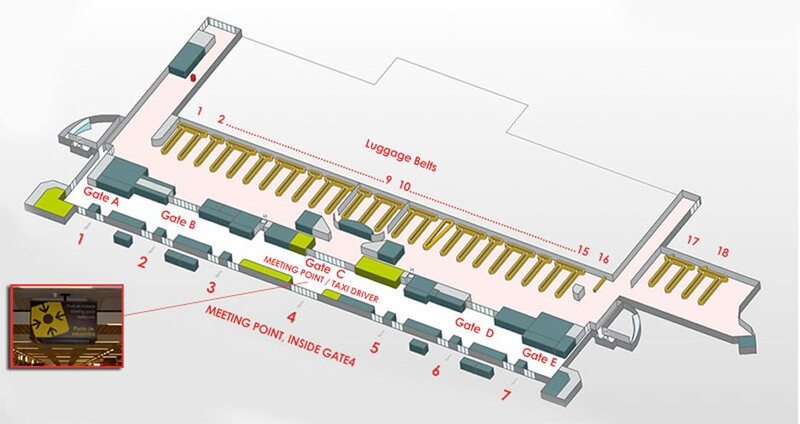 You can also book online , prebooked taxi drivers wait for their customers at the Meeting Point , located in the middle of the arrival hall of the airport. TIB  runs train services between Mallorcan towns. There is no train service to the airport. The main Train, Bus, and Metro station ('Estacio Intermodal') is underground, at Placa Espanya in Palma. 'Ferrocarril de Soller' operates the quaint wooden electric train from Placa Espanya in Palma to Soller town, in the north-west of the island, and from where you can continue your relaxing scenic journey to Puerto Soller on the companion Electric Tram. Information about the train is here. EMT runs the local bus service in Palma. Regional buses to destinations around the island are operated mainly by TIB. All EMT buses are equipped with onboard screens that state the current and next stop. EMT's line number 1 will take you from the airport through Palma downtown and to the outer dock of the main harbor (where most large cruise ships dock). Line number 21 will take you from the airport to Arenal. As at September 2016 the fare for line 1 and 21 is €5 for non residents of the island. There is only one fare on all EMT buses, so you don't need to specify your destination to the driver/conductor! All other local EMT destinations within Palma cost €1.50. In an effort to reduce drunk driving and get less people driving on the weekends, Palma offers a ´bus de nit´ bus service. In Catalán, it obviously means ´night bus´. It is full of locals, and Spaniards from the peninsula and runs from 10PM to 6AM every 20 to 30 minutes all night long. The bus costs 1€ and goes all the way down the infamous ´paseo maritimo´, which is where all the best clubs are in Palma. Tip; if you really enjoy clubbing, do not be afraid to go a few miles along the Paseo Maritimo. The numbers start at 1 and go up to about 80. The biggest clubs (i.e. Tito´s and Level) are located in the 20´s. Farther down the Paseo the music gets better, the people are more mature, and you will find less completely drunk tourists. Baleària  (ph 966 42 87 00) run ferries from Denia, Valencia, and Ibiza. Alquiler de yates en Mallorca  (ph 620269020) Denia, Valencia , and Ibiza. Trasmediterranea  (ph 902 45 46 45) run ferries from Barcelona, Valencia, Ibiza and Mahon. Iscomar Ferries  (ph 902 11 91 28 or 971 43 75 00 for international callers) run ferries from Barcelona, Valencia, Ibiza and Denia. Buses and trains are the two forms of shared public transport in Palma de Mallorca. The local buses are run by Empresa Municipal de Transportes Urbanes de Palma de Mallorca (EMT) and are very frequent. They have particularly good coverage of the beaches and the centre of the city. Timetables and fares are available from the City Council . The main train system is operated by Serveis Ferroviaris de Mallorca (SFM), Mallorca Railway Services. The Palma City Sightseeing bus (which is numbered line 50 on the EMT bus maps ) does a circuit of Palma that includes tourist attractions like Pueblo Español and major shopping centres like Av. Jaume III and Porto Pi, as well as the ferry and commercial ports. The buses are double-decker and the top floor is open air. A basic audio tour is free with the tickets. The tickets are €15 adults and €6,50 children for one day (24 Hours) which is much higher than the other city buses, but they are valid for reboarding as many times as you like within 24 hours, and this is the only bus route that visits the Castell de Bellver. The Two-day fare is € 16,25 for Adults and € 8,13 for children from the age of 8 to 16. The first bus in the winter season starts from Cathedral at 10:00AM and the last bus in winter starts from the same place at 06:00PM. Castell de Bellver. ph 971 73 06 57 or 971 45 12 03, fax 971 45 43 73, web page. Bellver Castle is built on the ruins of a Muslim site. It contains a museum of archaeological finds and classical sculptures, as well as having an excellent view of the bay. One of the most distinct castles in Spain; a 14th century castle set high on a hill. 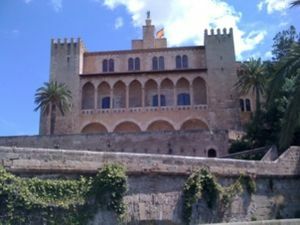 Castell de Bellver offers visitors the best view of the bay of Palma and the entire city of Palma. Known for its uniquely circular form, Castell de Bellver has three large towers, a central courtyard, and other features shown throughout the architecture of the interior and exterior. The greatest way to tour this castle starts with a walk around the moat. Then, proceed to the top of this castle to a patio area to experience glorious architecture. Castell de Bellver is open for visitors daily all year long. It is open on weekdays 8:30 AM to 6 PM, and Sundays and bank holidays 10AM to 5:30 pm. On Mondays the Castell closes earlier (1:30 PM). Admission for Adults is €4 (May '14) and €1.05 for pensioners and students. Pueblo Español, C- del Poble Espanyol. Ph: 971 73 70 70 or 971 73 70 75, fax 971 73 15 92, e-mail: [email protected]. This architectural museum is designed like a small village containing facsimiles of the major classical works of Spanish architecture. During the week there are numerous artisans' shops, restaurants and bars operating within the museum. Open from 9.00 a.m. until 7.00 p.m. Admission is €5 adults and €3 children. Catedral de Mallorca  and Museo Catedralicio, C/ Capiscolato, 2. Ph: 971 72 31 30 or 971 71 31 33, fax: 971 71 93 87, e-mail: [email protected]. Mallorca's spectacular cathedral is located close to the sea-side. The museum, located in the chapter room and vestry, has exhibits of religious paintings and silverware. The museum opens at 10.00 a.m., and its weekday closing hours are 5.15 p.m.(April to May), 6.15 p.m. (June to September), 5.15 p.m.(October) and 3.15 p.m.(November to March). On weekends it closes at 2.15 p.m. (all year). 4 Euro to enter. Banys Àrabs, C/- Serra 3. Ph: 971 72 15 49. The Arab bath building is the only building in Palma dating to the Arab settlement. The baths were constructed in the tenth century, and were sauna-style: the floor was heated and water added to make the room steamy. 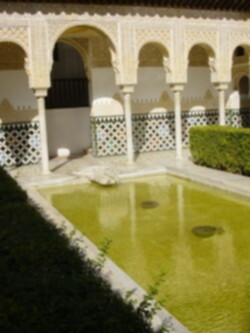 A small courtyard and the two rooms of the baths themselves are open to ten people at a time. €2,00 adults and free for children. Museo de Arte Español Contemporáneo , Sant Miquel, 11. Ph: 971 71 35 15 or 971 71 04 28, e-mail: [email protected]. 10.00 a.m.to 6.30 p.m. weekdays and 10.30 a.m. to 2.00 p.m. Saturdays. This branch of the museum of contemporary art has a permanent collection of over seventy pieces by modern Spanish artists including Pablo Picasso, Joan Miró, Juan Gris and Salvador Dalí. Free admission. Plaça del Mercat, church and interesting art nouveau buildings. Bull Ring, located on the Avenue de Gaspar Bennazar. If you are not into animal cruelty then just have a look around the arena. It is open when there are no events taking place. It is a fairly impressive structure. Beach. This does not seem to be sign-posted from the town centre but just follow the ones to the Parc de la Mar (the park by the sea). When you get there face the sea and walk left along the main coast road for 5-10 minutes. This part of the beach is fairly noisy due to the traffic so go to the other end where the road veers away. There are also some showers here. Ciudad Jardín is very a white sandy beach, 450m long and 45m wide and protected from bad weather by a series of jetties. This beach has moderate waves and is located in Ciudad Jardín residential area, a pleasant neighborhood that is surrounded by the La Torre d’en Pau Park, where all buildings are low-rise and are flourished with many outside, beautiful gardens. Ciudad Jardín offers many facilities for visitors, such as, free showers, telephones, beach umbrella rentals, hammock rentals, Boat rentals, as well as, plenty of bars and restaurants, and shops. Cala Major (Cala Mayor) is positioned only a few kilometers West of Palma de Mallorca. The beach is 200 meters long and 80 meters wide. The water is crystal clear. The beach is surrounded by high hotels and tends to be crowded during the months of July and August. Cala Major, is suited for children, only always pedal boats, and has a promenade that visitors or locals can find a number of restaurants and bars. Can Pere Antoni is 735 meters long and 25 meters wide. This beach is to be found just in front of the cathedral of La Seu, beside the beautiful promenade. This is one of the most pleasant locations in Palma to go cycling. A cycle path is available, that stretches the entire length of the Bay. Can Pere Antoni has a restaurant available as well. ELLA International Lesbian Festival is a 9 days culture, sports, music & arts festival that brings together several thousands of women in the beautiful and sunny island of Mallorca. The 3rd edition of ELLA will take place from the 1st-9th SEPT 2015, and will carry a much stronger cultural and social content throught the organization of the first International Lesbian Business Convention and a Film Festival. All EU citizens have the legal right to work. Getting a job, even temporary ones, for non-Spanish speakers is hard to find in a Spanish speaking environment (most Spanish do not speak English). So you may try looking for temporary jobs as bartending or waiting at English, Irish or German owned bars and restaurants, mainly in cities outside Palma like Magalluf, S'Arenal and Peguera (for German speaking travellers). In Palma you may try getting day-work washing boats at Palma´s Marina. There are several boats and some of the owners may need a hand. Be around 8AM at the Marina and start asking for "day work" to people around the big boats. If you're lucky you'll be making around 100 euros!. Pamboli - traditional "sandwich", made with Majorcan bread, plenty of oil and tomato, and then with the topping of your choice. Ensaimada - literally translated as "made from pork fat" - traditional pastry here, sometimes it just has powdered sugar on top, other times it is filled with chocolate, cream, fruit filling. Sobrasada - raw, cured sausage that is typical of Mallorca. Placa d'en Coll: previously a reasonably good town square in the Casco Antiguo part of the old town of Palma, with a few quite respectable bars and cafes but with the incongruous and slightly disquieting presence of 'the travelling population' with their giant supermarket-style plastic bottles of warm San Miguel concealed in brown paper bags. All very nice polite guys (and girls) actually! - but recently (May 2011) Placa d'en Coll is transformed into a cornucopia of bars and cafes, vying with each other on quality and price: the ideal place to visit for a 3-course menu del dia for less than fifteen Euros! - a veritable serendipity! Cafe Port Pesquer, C/- Moll de la Llotja. ph 971 725 868 or 971 715 220. This portside cafe is a seafood specialist, and also serves local specialities like tapas and platos mediterráneos. It is popular with locals and tourists, but is perhaps a little under-staffed. Mains €14 - €20. XII Apóstoles, C/- Sant Ramon Nonat. ph 971 262 015. fax 971 264 765, email [email protected] This opulently decorated pizza restaurant has a pizza topping for each of the eponymous apostles. The enormous pizzas have a thin crust and sparse but intense toppings. Bookings advised if you're eating after 8:30PM. Pizzas €10 - €15. Wine €20 - €50. The Mallorca high season is between July and September. Book especially early during any holiday weeks or weekends in the United Kingdom or Germany, as Mallorca and Palma in particular are popular holiday spots for people from these countries. Many hotels close in winter, so booking is also advised then. Hotel Gala, C/- Xabec, 5. ph 971 26 08 12 or 971 40 09 69 (bookings), (fax 971 26 15 12), . Reviews describe this three star hotel as in a good location near the beach and not far from the airport. It is described as an ideal family hotel with plenty of entertainment and a good distance from local restaurants and activities. Double rooms €69 per night (high season, 16 July - 15 Sept), €49 per night (low season). Hotel Isla Mallorca, Plaza Almirante Churruca, 5. ph 971 28 12 00 (fax 971 45 65 03 [email protected]), . Reviews describe this hotel as being well equipped and close to the commercial centre of the city. The facilities are oriented towards business travelers and include Internet access and a fax service for guests. Double rooms with breakfast only €100 per night (high season, July - Sept), €80 per night (low season). Double rooms with all meals €140 per night (high season), €120 per night (low season). Hotel Dalt Murada , C/- Almudaina. Ph: 971 42 53 00, fax: 971 71 97 08, e-mail: [email protected]. Reviews describe this small hotel as delightful: it is located in a refurbished 16th century building near the cathedral, and the rooms have period furnishings. The rooms have hydromassage baths, internet access and satellite TV. Double rooms from €140 per night and suites from €186 per night. Villa Bendinat, . A good option for a group of 4 to 6 travelers to Mallorca. Las Arcadias, . Las Arcadias is located in central Palma de Mallorca, 15 minutes’ walk from Plaza de España Square. The harbour, Palma Cathedral and Almudaina Palace are within 2 km away. A well-equipped apartment intended mainly for seniors. Big Byte, C/- Apuntadores 6, Bajos. ph 971 71 17 54. fax 971 72 62 67, email: [email protected], . This internet cafe includes DSL and wireless access and printing and fax facilities. [email protected], Terrazas Porto Pi, Paseo Maritimo, 54, ph 971 70 38 79. This Internet cafe has 34 computers available using a broadband connection. CyberCentral, Soledad 4, Bajos. ph 971 71 29 27. fax 971 72 01 68, . This Internet cafe has DSL access and laptop access for €3 per hour. Printing is €0,20 black and white and €0,90 color. Be aware of pickpockets when walking around the centre. They can even steal loose change from your back-pocket! If you do stop at any of the many terraces in the centre, keep an eye on your valuables and never leave them alone. You will probably find women offering flowers around the Cathedral. They will do their best to take what ever they can from you. If you see them, pass on. Most areas of Palma are safe to wander around even after dark. Visitors should refrain from wandering alone after dark through the empty narrow streets of the Old Town and El Terreno. Remember Palma de Mallorca (as well as the other Balearic islands) is full of club drugs. Ecstasy, cocaine, marijuana and more can be found especially in the club scene. Be cautious of drugs like GHB, ketamine and others which can be slipped into drinks (especially in Sangria found in restaurants). Personal drug possession in Spain is legal (considered to be less than 500 doses), but trafficking is illegal. Keep all valuables out of sight when sightseeing. Wallets and purses to be kept in front or hidden in pockets. Any excess cash, cards, passports, and valuable documents are best left in the hotel or wherever visitor is staying to stay safe. It is always safe to take a taxi during late hours, especially if you are alone. Use your common sense to stay safe. Take a journey on a vintage train from the Plaza d'Espanya to Sóller. Sóller is a beautiful small-town getaway, and the slow train journey through the citrus groves has magnificent views of the western mountains. Groups can get a deal for about 10 euros, but depending on the day of the week, tourists can make the round-trip day adventure for about 17 euros. You can then take a tram from Soller train station to the Port de Sóller, located on a large bay. The journey takes about 15 minutes and costs 4 euros (one way). The port of Sóller is full of tourists attractions and shops, and has breathtaking views from the top of the hill on the island.